Today is one of those days, that didn't exactly go as planned. We had been out of town all weekend, and got back yesterday. I was looking forward to both boys going to school today, so I could run errands, catch up on laundry, etc, etc. Well, that all changed when Beckham started throwing up in the middle of the night, and continued to be sick for the majority of the early hours this morning. Sick in his bed, sick in my bed, sick on the rocking chair... Blah. Instead of getting several things crossed off my "to-do" list, I am actually adding more to it. I just have to say thank the Lord for washers and dryers. They have both been running non stop, trying to catch up with all of the sheets and clothes and stuffed animals that need to be washed after a weekend away, and a sick night. I had plans for a different post for today, but since I had this one already prepared in my drafts, this is going to have to do! It's actually a super yummy recipe that I have been meaning to share with you, and just hadn't found the right time. So, let's get on with it, shall we? 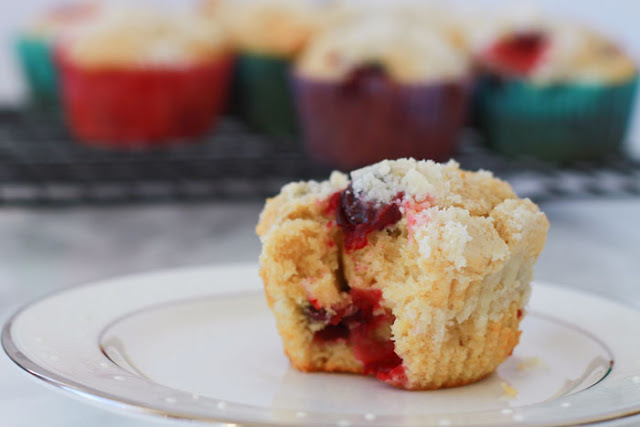 Whole Wheat Cream Cheese Cranberry Streusel Muffins! Whoa! That's a mouthful of a title! It felt necessary to include all of the key ingredients to lure you into wanting to make these babies ASAP! 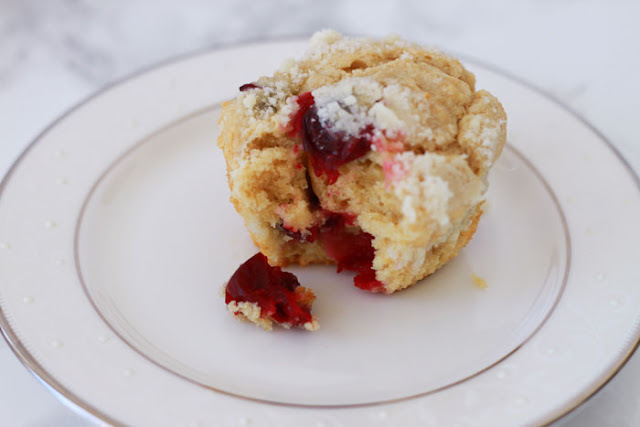 A sweet muffin combined with a slightly tart cranberry and a little extra sweetness in the streusel topping--the perfect combination! Let's talk about flour for a second. Whole wheat pastry flour has rocked my world! While trying to make an effort to cut down on the amount of processed, white flour, I switched to using whole wheat flour. But I have to say, it was a rough adjustment. Baked goods turned out heavier, and it seemed like it was hard to simply swap whole wheat for all-purpose flour. However, I have found a new love in life! Whole wheat pastry flour is so fine, not grainy, and makes fluffy baked goods! It's quite amazing actually! And, cream cheese. Need I say more? It makes everything taste better! So, let's get to these muffins! We have had a couple of snow days already here in Kansas City, so I treat those as bonus days and we try to make the most of them! I don't allow the boys to have sweet breakfast foods during the week, but on snow days, we make exceptions! The first snow day we had, they requested blueberry muffins, but I didn't have any blueberries. And considering we were snowed in, we had to think of a plan B. We happened to have some cranberries in our freezer, so we got a little creative! Here are the ingredients. I rarely have a chance to take a picture before everything gets thrown into the bowl, so I hope you reeeeeally enjoy this pic! Ha! And, if you have a helper or two, it usually makes the process more fun, ahem, messy. Preheat oven to 350°. In the bowl of a stand mixer, cream butter, cream cheese and sugar until fluffy. Add eggs, beating well to blend, then add vanilla. Add flour, salt, and baking powder continuing to mix until blended. Gently fold in the cranberries. The mixture will be quite thick. To make the streusel topping, whisk together the flour, sugar, and cinnamon. Add the melted butter and stir with a fork until well blended and crumbly. Fill paper lined muffin cups 3/4 full with the muffin batter. 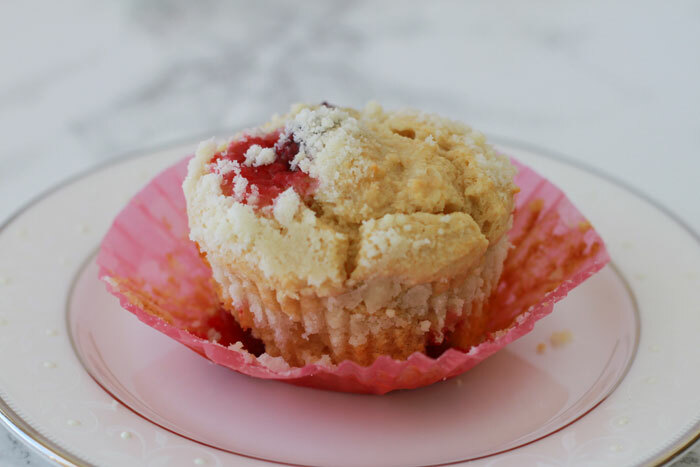 Top with the streusel topping (about 1 tsp per muffin) and bake 20-25 minutes. They may need a few extra minutes if working with frozen cranberries. You can check to insure they are done by inserting a toothpick. If it comes out clean, then they are finished baking!